When you purchase a safety poster from SafetyBanners.Org it is ALWAYS laminated and produced ready for use in an insustrial environment. Look under the "Posters Tab" for any image you click. Every safety banner has a corresponding vertical safety poster. On the image order page that has the tabs, the vertical image on your right is what that specific safety poster will look like. Our posters come in several sizes from a small safety poster to a large safety poster. 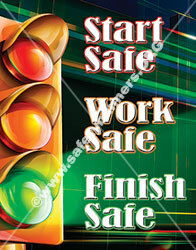 Custom size safety posters can be produced but require a custom price quote. Call or email us with your specific size needs for your personalized quote. The industrial workplace needs to communicate with their employees about safety on an ongoing basis. Safety posters are an excellent and low cost way to both communicate safety with your employees and to encourage safe behavior. 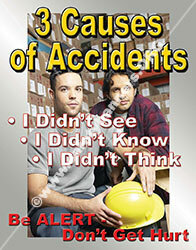 Many American companies use safety posters in their industrial facility or warehouse. Facility safety managers choose safety posters that are relevant to their workplace and the responsibilities of their workers. 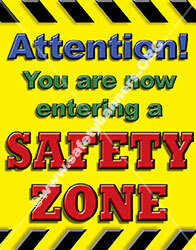 Only SafetyBanners.Org has America's largest selection of laminated safety posters at low prices delivered fast. Over 800 safety posters are available online. * Deliver your safety messages in many new and interesting ways … so employees don't begin to ignore your messages.